Granite J. McCutcheon provides unique craftsmanship for your custom granite monuments, tombstones and memorials; whether you are looking for traditional or more modern monuments, we will take the time to understand your needs and help you design the perfect monument to honour and to remember. Once you have selected the natural stone and decided on the shape and the design for your monument or memorial, using laser engraving, we will add text, colour and images in order to personalize the monument or memorial; a hand etched look or a crisp appearance, either way, we can provide you with a detailed end result that will meet your requirements and wishes. Granite J. McCutcheon is also a landscaping stone supplier and other natural stone products that can be used in the construction and landscaping industries. 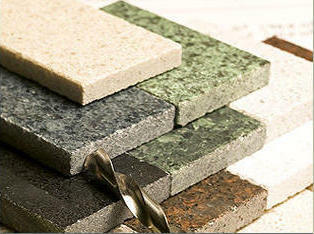 Whether you are seeking granite, slate, sandstone, limestone or flagstone come and visit our yard and see our inventory. Using our vast selection of landscaping stones, we will help you select the perfect natural stones to complete your project and beautify your home; slate steps, natural stone veneers, retaining walls, flower beds, walkways and paths, we have the ideal natural stones for every outdoor project. With over 40 years of experience in the granite transformation industry and thanks to our modern manufacturing facility, we will customize your granite monument, tombstone or memorial using modern techniques such as a computerized granite laser etching system or a computerized sandblasting system. This tombstone is made of one of our finest garnite that we have in our yard.